A magical “sea of stars” is one of the most heavenly experiences on this planet and the Maldives is one of the best places to get close and personal, Donna Richardson discovers. 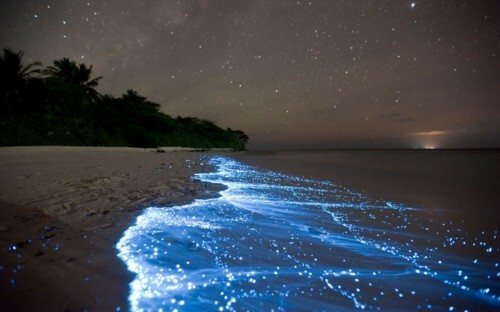 As ethereal as the constellations above, these stars of the sea are actually caused by bioluminescent phytoplankton, algae known as Lingulodinium polyedrum. These algae bodies are covered with rigid but intricate shells with interlocking parts that rely on the ocean currents to travel. 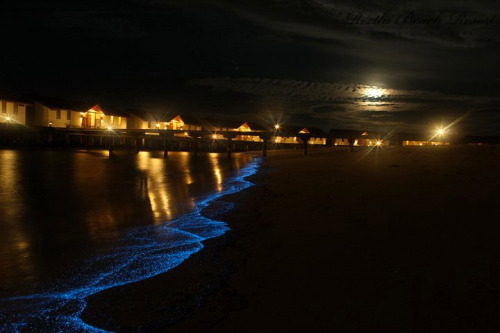 Upon reaching the shore, these tiny organisms emit light when stressed. They react to the lapping of waves, the carving action of a surf board or a hand or foot. The end effect creates what looks like a network of stars. Vaadhoo Island, in Raa Atoll is a prime backpacker spot to see this magical phenomenon. Delighted honeymooners at the Reethi Beach regularly enjoy this phenomenon and the first time I personally saw the plankton in full shining glory was during a full moon party at the Sheraton resort. It was so beautiful, I almost cried. Dancing with my feet in the sea of stars to the beat of the Temper Trap, this moment will forever echo in my mind. The words below sum up the moment perfectly. Oh how I long to dance once more in the sea of stars.